Justine F. Andronici is an advocate, attorney, trainer and consultant specializing in women's rights, victims rights and social justice. Justine's career has been dedicated to advocating for women's rights and social justice. She has spent her whole career working to empower victims/survivors while holding perpetrators and the institutions and systems that enable them accountable. Justine is an attorney who has represented victims for over 15 years and now focuses her work as a consultant and trainer, educating the public, lawyers, and systems professionals on women's rights, sexual assault, sexual abuse and domestic violence on how better to address the needs of survivors. Justine has a unique combination of legal, advocacy, non-profit management and strategic communications experience. She uses an empowerment-based model in all of her work, placing the needs of the marginalized at the center of the work. After years of living and working in cities throughout the US, including Washington DC, Baltimore, Los Angeles and Boston, Justine settled in rural Central Pennsylvania, where she has lived for 13 years. Justine has also been active in rural politics, working to elect progressive local leaders in her community and to make change for survivors in rural legal systems. An unwavering and strong public voice for the needs of survivors and matters of women's rights and social justice, Justine provides expert analysis and commentary on television, radio and in print media. Ms. Andronici is a Graduate of Colgate University (B.A 1994), and University of Pennsylvania Law School (J.D. 2002). She is a alumnae of the Georgetown Women's Law and Public Policy Fellowship Program (2002-2003). She is a member of the Bar in Pennsylvania, Maryland, Washington, D.C.(inactive) and Massachusetts (inactive). Justine lives with her husband, dog cat and peahen (female peacock) in rural Central Pennsylvania. She is also a certified yoga, conscious breathing, and meditation instructor, offering private instruction and workshops focused on finding calm and making change. "The clients I have served throughout my career continue to be my greatest inspiration. They are the strongest people I have ever known. I think it is long past time for all of us to listen and really learn, especially from women and survivors." Feb. 16, 2019. 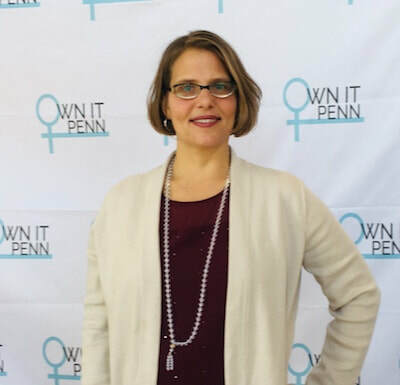 Justine spoke to Penn undergraduate and graduate students at OWN IT Penn 2019, held at University of Pennsylvania. Discussing owning privilege, redesigning the table, redefining success, making room for others, and the future of women's leadership. Video Clip - "What does "Own It" mean to you?" Andronici speaks at rally of survivors in opposition to Judge Kavanaugh's confirmation. ‘Why don’t people disclose’ ... that’s not the question. The question is, how in the hell--given how hard it is--do people have the courage to do that, and why aren’t we supporting each and every one of them, as if they are our heroes?